It all began soon after Millville became a township in 1801. For some years little thought was given to fire protection until February 16, 1832, when the Millville Union Fire Company was incorporated. In the years following its incorporation, the Union Company either failed or ceased to exist for some unknown reason. It was during this time that the township purchased a hand operated fire engine, that the citizens of Millville used to fight fire. On July 18, 1872, the Mulford and Reeves lumberyard fire started a sequence of events that led the local newspaper to print on April 30, 1880, an article that stated the need for an organized fire company. On May 14, 1880, a few volunteers grouped together and formed the Resolution Hose Co. No. 3. Reuben Meredith served as the first president and Charles W. Hunt the first fire chief. Headquarters for the new company was a barn on Smith Street between Second and Third streets. The Company answered seven alarms the first year. In 1908, the department consisted of a chief and forty men. Two paid drivers were kept on duty and housed at the firehouse. A brick sub-station and two frame hose houses were located in different portions of the city. Fire apparatus at this time was: one hose wagon, four hose carts, one hook and ladder wagon, 153 feet run of ladders, 4500 feet of hose and eight hand extinguishers. All but three hose carts were drawn by two horses. In 1915, the first motor driven truck was purchased but horses remained on the scene until 1918 when two Mack trucks were put into service. Pictured here is a 1914 American LaFrance hose wagon followed by the Marquette which was the first motorized fire apparatus of Millville. 1882, Millville opened their new headquarters that also served as City Hall. In November 1915, the Resolution Hose Co. No. 3 was incorporated as the Millville Fire Department. September 10, 1955, ground was broken for the current firehouse at Buck and Oak streets, which was occupied on January 19, 1957. On January 1, 1976, the bell memorial was dedicated in memory of all Millville deceased firemen. Nineteen years before it had hung in the tower of the old fire hall at Second and Sassafras streets. It was used to sound an alarm of fire and tolled upon the death of a member of the department. In January 1989, a gazebo was built to protect the bell from the weather. On November 3, 1976, fire destroyed the old cotton mill in which nine of the surrounding fire companies joined Millville in fighting the fire. The nine companies were South Vineland, Vineland, Bridgeton, Mauricetown, Gouldtown, Port Elizabeth, Port Norris, Cumberland, and the NJ Forest Fire Service. and Florence streets, and Giuffras at 522 N. High Street which was a three story commercial structure of ordinary construction with apartments on the third floor. Sixty-nine men from Millville, with the help of South Vineland and Gouldtown fought the fire for ten hours in below freezing temperatures. Over the past few years the department has experienced several operational changes including; the transfer of it’s dispatching arrangement to the county’s Emergency 9-1-1 Communications Center, the implementation of the Incident Command System at fire incidents, the creation of a tactical rescue team, the enforcement of the state’s Uniform Fire Code by on duty paid personnel, and probably most important, aggresive promotion of fire prevention and fire safety in the community. as August of 1998, when, the Millville Fire Department responded to 69 incidents. 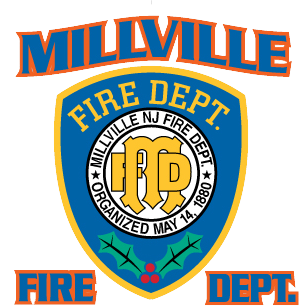 Today, the Millville Fire Department has fifty-six members including ten full-time career firefighters and career chief. The company operates 5 engines, 2 ladders, 1 rescue/cascade truck, 1 brush truck, 2 utility trucks, 2 thermal imaging cameras, a Tactical Rescue trailer, and a foam operations trailer. The company also has a state of the art Fire Prevention Trailer that is set up as a 2 story house with operating smoke detectors, heated bedroom door, for teaching children how to check doors for fire, and smoke simulation.